*Edit*: I have not tested this with legacy browsers (e.g., IE6 or IE7) and cannot guarantee it will work in your browser. If folks have fixes for particular browsers, I recommend you post them in the comments section below. The footer of the page sticks to the bottom of the content div. 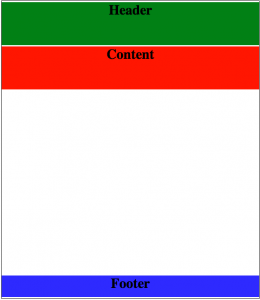 As the content grows and shrinks, the footer moves around all over the page. In this example, the footer sticks to the bottom of the page regardless of the size of the content. Using the preferred CSS method, we can force the footer to stick to the bottom of a page, regardless of the height of the content. You can view my example here. If you resize the browser window, you will notice that the footer remains at the bottom of the page at all times. I also recommend to use Chrome Dev Tools or Firebug to manipulate the CSS and HTML real-time; try changing the height of the content div so it exceeds the height of the window. You will notice the footer will remain on the bottom. 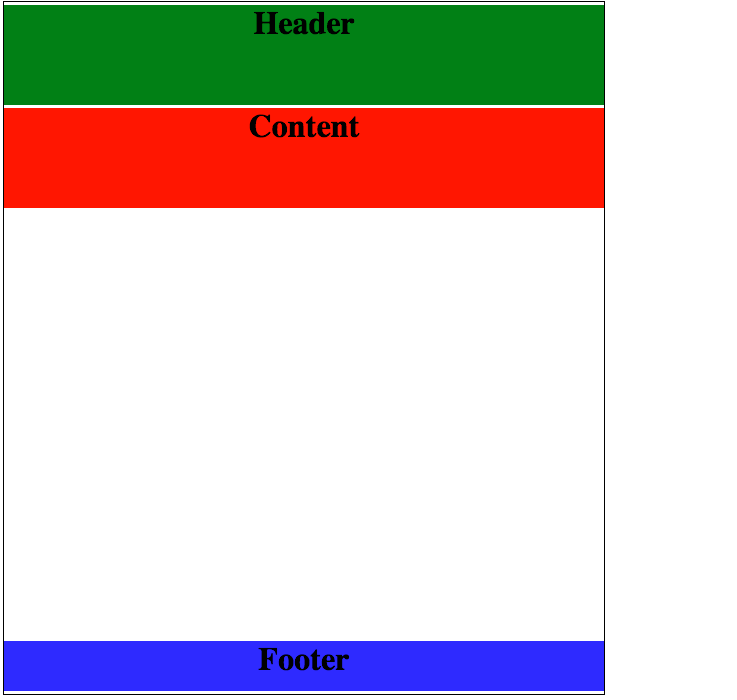 To accomplish this effect, we will make use of the position and bottom properties in CSS. Making the #wrapper div’s position relative indicates to the browser that the div is non-static. Secondly, we have to to set the #footer div’s position property to absolute. 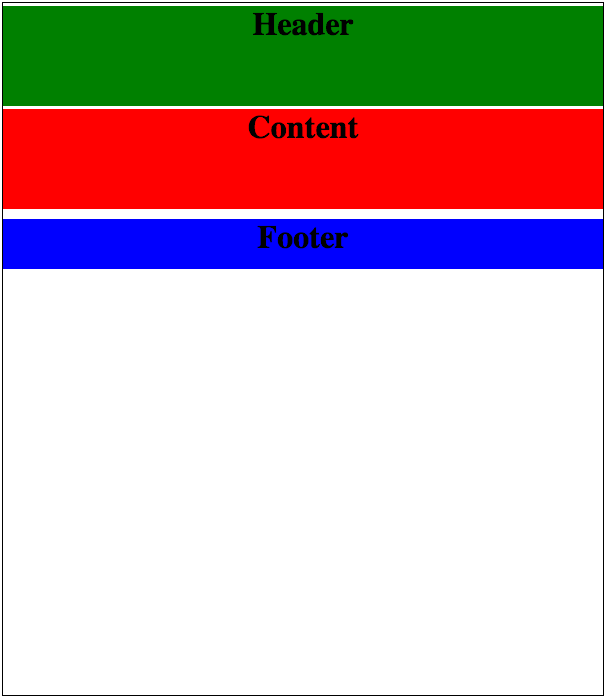 This tells the browser that the #footer div’s position should be relative to its first non-static ancestor element. In our case, the first non-static ancestor element of the footer div is the wrapper div (which is technically the footer’s parent div). Finally – to get the desired effect of having the footer “stick” to the bottom of the page, we have to add the bottom property to the #footer div. The bottom property tells the browser to position the #footer div’s bottom edges x pixels above or below the bottom edge of its contain element (#wrapper). To see the full page and the full CSS, click here. Using CSS to force the footer to the bottom of the page gives the page a cleaner look. We could have taken the JS approach, but in my opinion, CSS is a cleaner solution for this type of problem. This entry was posted in Random and tagged css by Rafiki. Bookmark the permalink. It seems to be working just when you scrunch the screen by minimizing it and bring the bottom up using your cursor/mouse to flex the screen to different sizes the footer rides up over the header and content. It does seem to be working for all the current browser versions that are out there. The thing is will it work for the older legacy browsers that some companies have held onto due to the inability to upgrade their Operating Systems? Good point. Unfortunately I have not tested this in legacy browsers. I will update the post and make a note that I have only tested in modern browsers. It is not working in the demo..
On my Mac, works great on Chrome and Safari; however, not Firefox 25 (latest version). footer is stuck beneath the content div (as in your starting point image above). Justin, was the height: 100% a fix for Firefox? I’m using Firefox 25. You demo doesn’t work i.e. the footer isn’t sticking to the bottom of the page. I’m working on an easy solution to this problem too. I’ll let you know what I come up with. Appears to work in Chrome. Fixed it. Add height: 100% to the body. Your fix works in Firefox 25 making this the best footer solution I have yet seen. …. but just as a footnote, beware that adding the HTML5 doctype declaration ” ” to the top of the document, appears to break this in Chrome. Hey your demo doesn’t work 🙁 Is there an alternative to this method? Hi Paul – What specifically isn’t working in the demo?